Sri Pumps & Fittings Industrial Corp.
Technical Specification: Check valves (also known as Non return Valves) are Automatic valves that prevent a return or reverse flow of the process. 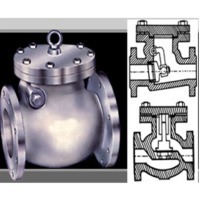 Check valves are used for two main purposes: First, to prevent back flow, and second, to maintain pressure. Material: Construction: AISI 304, AISI 316 & AISI 316L. Sizes: From 1" to 4" (25mm to 100 mm) Standards: Unions End Connections with SMS/IDF & DIN.. Quality Tests: tests & Pressure Tests. Design: BS 5153, DIN3352. Face to Face: BS EN 558-1, DIN3202-F6. Flange: BS EN 1092-2. Size: DN40-DN600. Working pressure: PN10/PN16. Working Temperature: -40centigrade degree - 225centigrade degree. Suitable Medium: Water, Oil, Steam. Material: ductile cast iron, Cast Steel, Stainless. Short on time? Let check-valve sellers contact you. Check Valve Applications - Machine tools, Construction & heavy-duty industries - Shipbuilding equipments applications. Check valve is a mechanical device which is normally used to allow easy flow of fluid or gas to in a linear direction. All our products are built using high quality materials thus offering longer durability and efficiency. We are an ISO 9001 & 14001 certified company offering environment friendly products. Our aim is to set high standards in the valve manufacturing and supplying industry through continuous R&D and process improvement. Our grease valve fins application is various types of industries including heavy-duty operational enviromnets. Nominal Diameters:DN10~DN1000(3/8'-40'). Nominal Pressure:PN1.6~42.0Mpa( 150lb ~ 2500lb ). Materials: A105, LF2, F5, F11, F22, F304, F 304L , F316, F 316L , WCB, WC6, WC9, CF 8M , CF3, CF 3M etc. Check valve Check valve in cast iron and ductile iron, flanged and wafer, single door and dual plate, which accord with din ansi bs standard, it is popular used in water works. Hisky International Trading Co., Ltd. 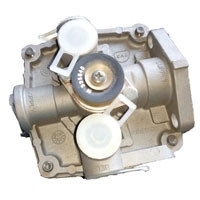 Magnetic check valve was designed with magnet diaphragm, and sealed by the metal. it was used on the exhaust pipe of the compressor, for inside, it uses guide device and automatic suchtion design thant prevent reverse refrigerant flow in liquid lines and compressor discharge lines.